Another week is gone, and another set of great posts is here to share on the post review for the week. First, the guitar making series continues with bracing the top. Then, it’s a huge guide to sandpaper grits and uses. Finally, a list of things I wish I knew when I started making wooden rings. Enjoy. 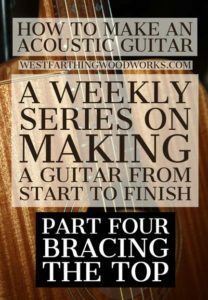 In How to Make an Acoustic Guitar – Part Four – Bracing the Top, I’ll show you the entire process for adding your internal braces to the guitar top. This is demonstrated on the Mahogany guitar, and is easy to follow. This part of the series is about cutting the braces, and installing them on the soundboard. It covers placing the braces, gluing them to the top, and the order they need to be glued down. You can use this same set of instructions to follow your bracing plan from any book, and you will have good results from the process. There are a lot of secrets and details shared that can take a long time to learn on your own, so enjoy. 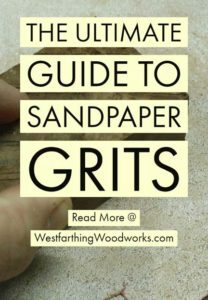 This week’s woodworking tips post is called The Ultimate Guide to Sandpaper Grits, and it’s your secret weapon to knowing and understanding how the grit system works, and why you even care in the first place. Not only is there a detailed explanation of every common grits and what you can use them for, there is also a handy grit chart that breaks it down very well. Understanding how sandpaper works is important to you as a new woodworker. As you work with sandpaper, knowing these ideas is what will make the process more enjoyable, and less of a chore. Sanding can be a pain, so don’t waste time. Instead, learn the secrets you need to know to make the process a lot easier. In 25 Things I wish I Knew When I Started Making Wooden Rings, I share the biggest ideas and concepts that I wish I knew when I started making rings. There are a lot of things that you just don’t know as a beginner. I was in the same boat. This list is a good starting point if you are interested in making rings yourself. Wooden ring making is not as difficult as it may look, even for a beginner. Had I know a lot of the things inside this post, I would have started sooner, and I would be farther ahead than I am right now. These lessons and tips come from mistakes, misconceptions, and incorrect ideas about what wooden ring making really is. They are all important, and they will all help you get off to a better start.